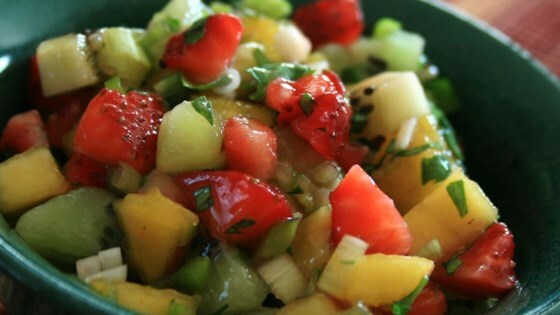 "A good summertime salsa that hits your taste buds twice. Can substitute canned peaches or frozen strawberries, but best to go with all fresh fruit." Great recipe, I served it with broiled tilapia, fresh garden peas and jalapeno hush-puppies. Easy to make and complimenting flavors. I'll make this one again. I made this for s summer BBQ and it was a hit. I did double the recipe as advised which I was glad about. I will definitely save this and make it again. Yum, good plain as a salad, with something off the grill, or with chips. I’ve also tried subbing mulberries in for strawberries and mint instead of cilantro. All combinations are delicious.